The New Skymall’s Here! The New Skymall’s Here! How many times do you think the word “revolutionary” is used in the Sky Mall Catalog? If I had a nickel for every time they used that word, I’d probably be able to afford some of that overpriced crap. Although, I must admit, having one of those would be pretty sweet. The only thing lacking is a Big Gulp cup holder on the side and a detachable bedpan. Then it would be slacktacular perfection! Alas, my heart belongs to Dave! On the road or at your desk, keep your beverage hot! NEW! This portable desk makes your laptop truly mobile. Hope you liked this post. There’s many more where that came from. 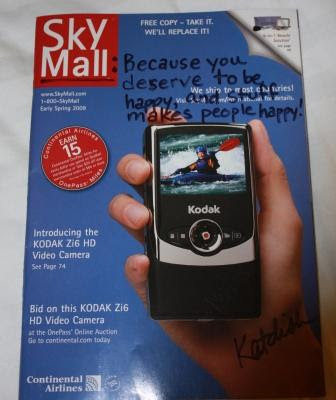 The Skymall Catalog: the gift of blog fodder that keeps on giving!